There is nothing better than perfectly seared salmon and I'm going to show you how to get it just right! 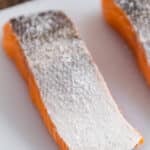 Remove the salmon from the refrigerator and let it rest for 15-20 minutes to bring it to room temperature. Pat it down with paper towel on all sides to remove moisture. Place it on a cutting board, skin-side up. Using the blade of a knife, scrape it up and down the skin to remove the scales (which will flake off). The scales have a bit of shimmer to them so you can tell if there were any left behind. Sprinkle salt on each side and let it sit for a couple minutes. Lightly give the fish one more pat down with paper towel to remove any moisture that the salt brought to the surface. 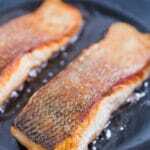 While the fish is sitting with the salt on it, place oil in the pan to cover the bottom of it and heat over medium-high heat until the oil shimmers. You can test it by adding a drop or two of water. IF the oil sizzles it's ready. If not wait another minute and try again. Add the salmon fillets one at a time, skin side down, directing them away from you. 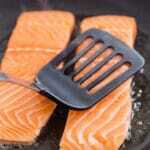 Press down on each piece of fish with the spatula for 10-20 seconds to ensure even searing. Allow the fish to cook most of the way like this, around 4 minutes. You'll be able to see the side of the fish begin to change color, starting at the bottom. When you go to turn it, you'll know it's ready to turn because it doesn't stick. If you find that it's sticking, wait another minute before trying again. Once it's flipped cook another 30 seconds-1 minutes to an internal temperature of 145 degrees(you can also go a little less if you want it to be more "medium" which is still safe to eat). Remove the salmon from the pan. Sprinkle with some black pepper if you want and plenty of fresh lemon juice. Serve immediately.